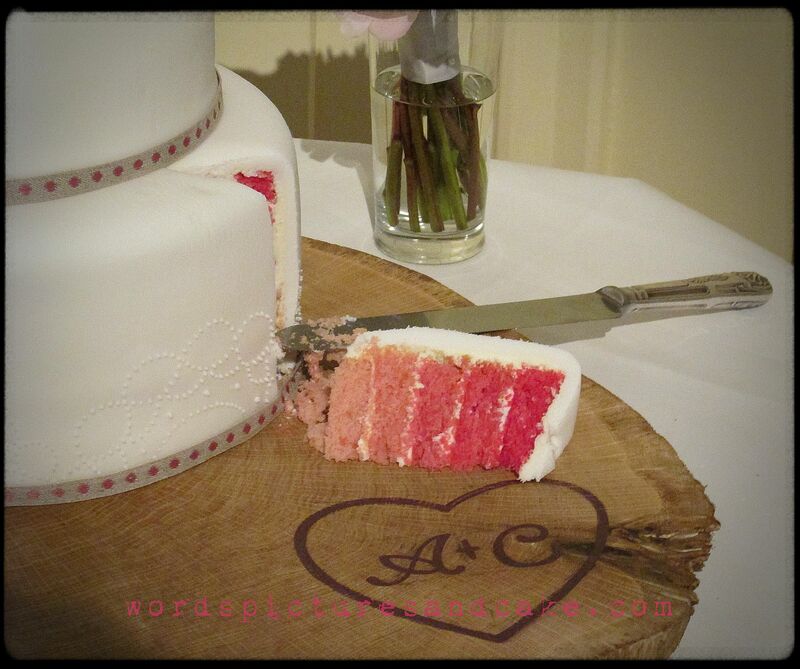 A few months ago, my Mum’s colleagues Andy and Clare asked me to make their wedding cake. Having sung at weddings for more years than I care to admit, I’m acutely aware of the honour of being asked to contribute to such an event, and of the significance of every detail to the couple in question. So after discussing their thoughts, I considered it carefully and decided that – with a trial or two – I could do it. Andy and Clare are designers, so they care a great deal about the aesthetic and fine detail of every element of their day. Fortunately, my perfectionist streak and control freakery are irrepressible. 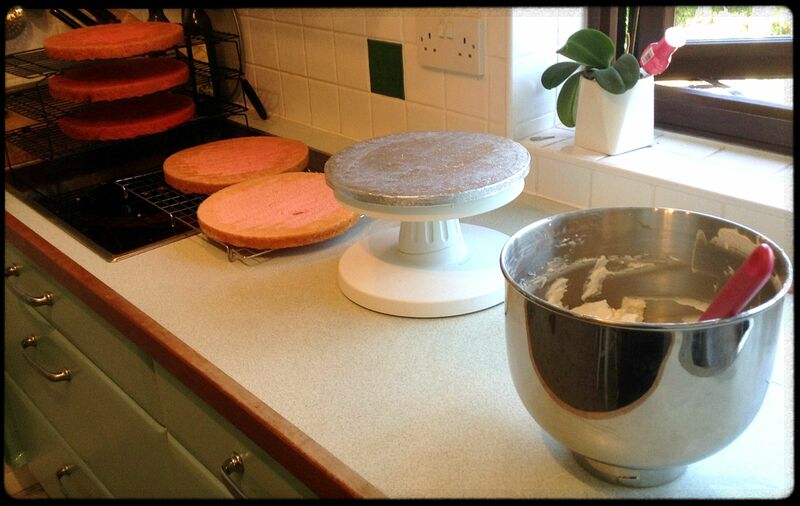 For the 14cm tall 5-layer 26cm sponge, I doubled these quantities, baked six sponges and discarded the palest. You might wonder why I didn’t just split the doubled quantities between five sponges rather than making six and discarding one. The reasons are twofold: (a) I didn’t want the cake to be so tall that fondant covering became impossible, and (b) I knew I had to mix the doubled recipe in two batches because I could only fit two sponges in the oven at once, and when cake mixture sits for too long before baking, it can go over and yield sub-standard results. I could get away with leaving one sponge-worth to sit for 20 minutes but not for much longer. Make sense? It also gave me the opportunity to Quality Check the sponge and – honestly – this was one of the lightest, fluffiest sponges I have ever baked. I’m a firm believer that the quality of ingredients has a direct impact on the quality of the result, so I raided Waitrose of its finest goods. Preheat to 180 (150 fan). Weigh empty mixing bowl. Beat butter, sugar and vanilla until almost white and very fluffy. Add half the flour and baking powder and beat a little. 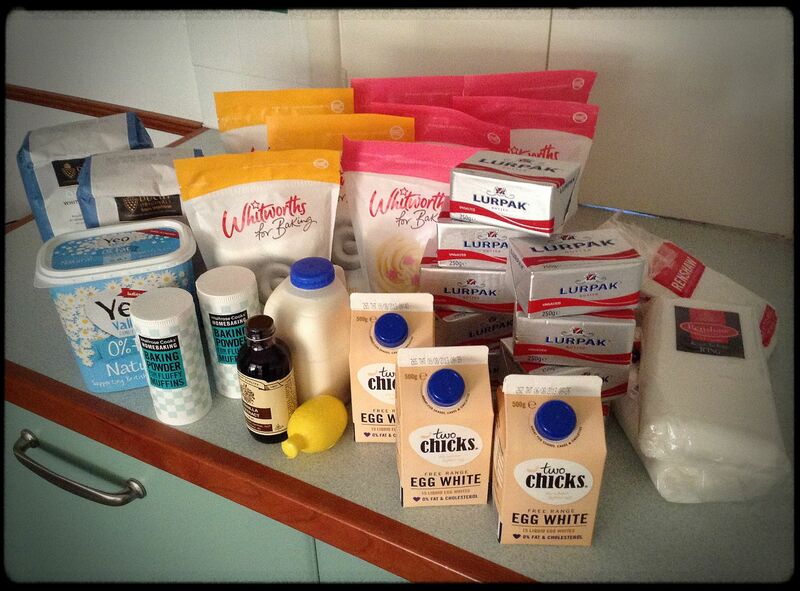 Add half the yoghurt and beat until combined. Add the rest of the flour and beat a little. Add the rest of the yoghurt and beat until combined. Weigh full mixing bowl, then divide mixture into however many bowls you decide you want. Whisk the egg white to soft peaks and set aside for a moment. Thoroughly mix your gel colouring into each bowl as desired. Split the egg white between the bowls and fold in thoroughly. Bake 20cm sponges for around 11-13 minutes; 26cm sponges for 17-20 minutes. I reduced the sugar in my buttercream because fondant is incredibly sweet and I didn’t want to be responsible for children at the wedding bouncing off the walls until midnight. Beat into submission – 5 minutes or more. The longer you beat, the fluffier it’ll be. I did a thin layer (shown below), refrigerated it for ten minutes, then did a slightly thicker layer over the top. Next came fun with fondant. My NEMESIS. 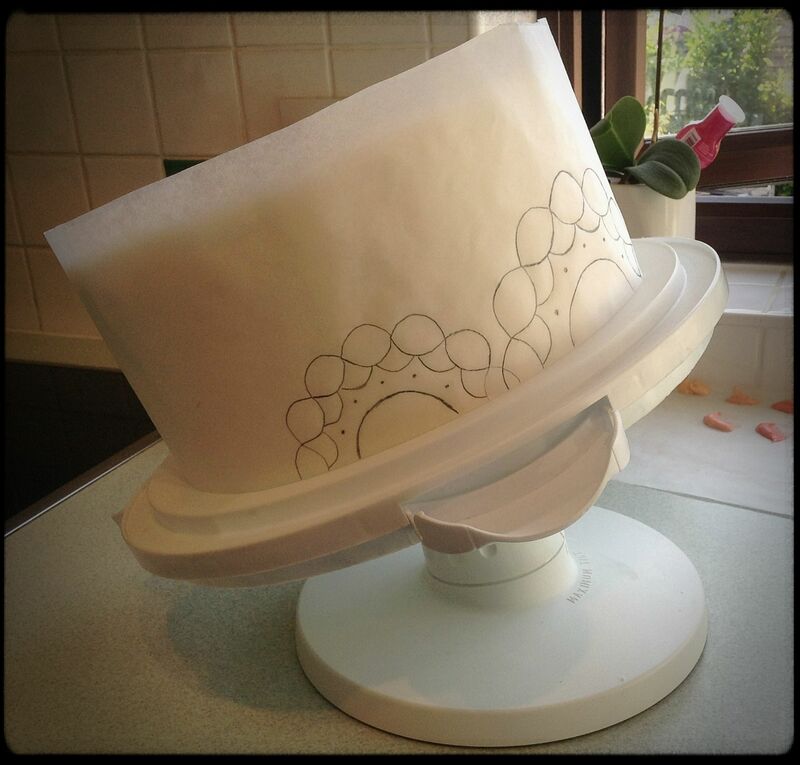 The fondant for The Big’Un had to be rolled to at least 54cm in diameter (which is only 6cm short of the depth of a standard kitchen worktop, I am told). Big. 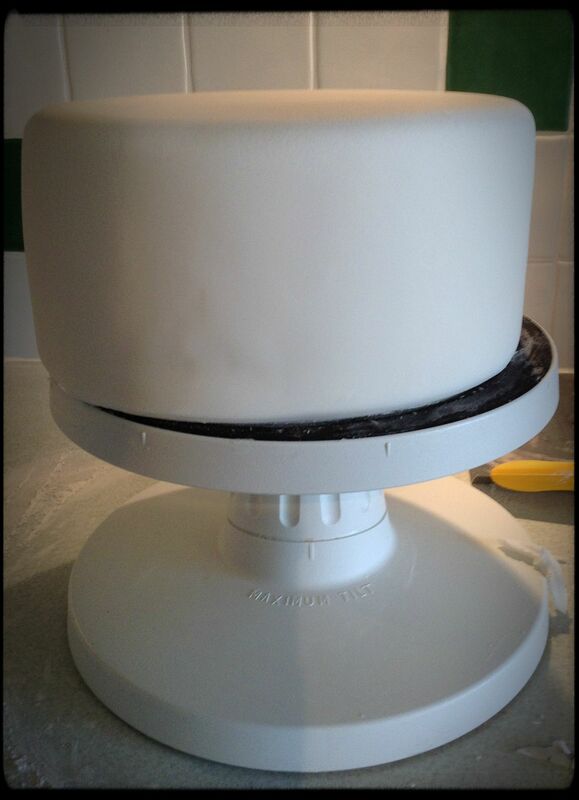 So I used about 2.25kg of Renshaw’s fondant for this one, and about 1.25kg for the 20cm tier. Wrangling so much fondant at such a massive diameter was really challenging for me, and I can’t say I was entirely happy with the finish but I did the absolute best I could, and the flaws were concealed by the top tier and forgiving lighting. 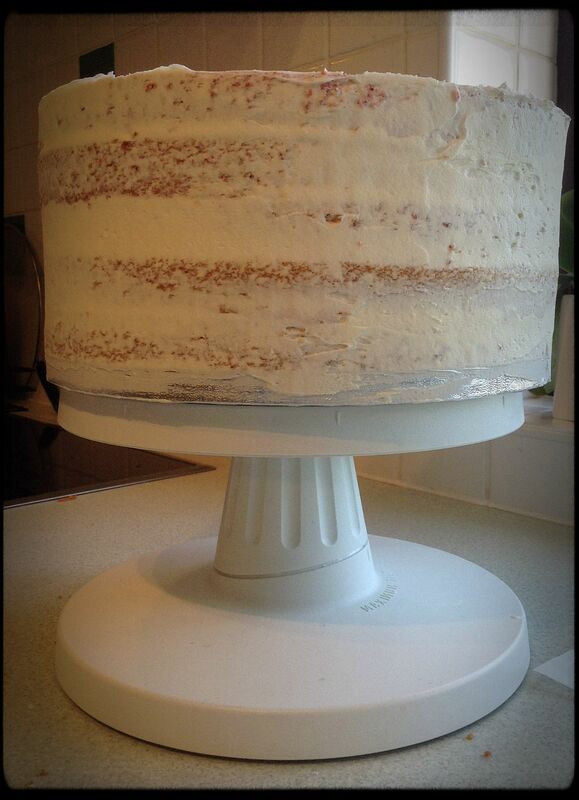 Thankfully, the top tier was absolutely perfect (even if I do say so myself). When it came to decorating the bottom tier, Andy and Clare found a gorgeous peony skeleton motif that would tie in beautifully with their fresh peonies. I drew the motif on grid paper, reduced it by 75% on a photocopier then traced the full sized one onto a long strip of baking paper, flanked by a smaller version either side. I then pinned this strip to the cake, used a blunt instrument to create a slight indent on the cake so that I could pipe the dots in the right place without the indents being visible. 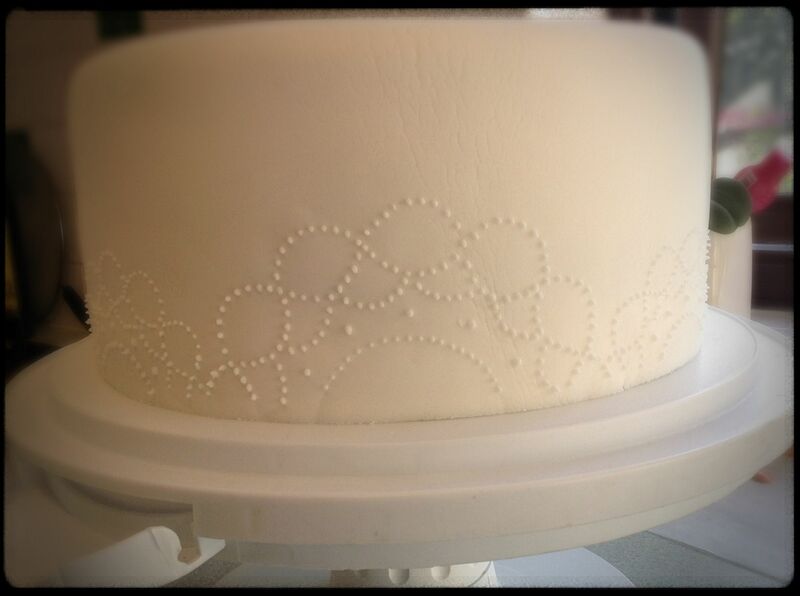 You’ll notice that the fondant goes all the way to the bottom of the cake. Beneath is a thick cake drum the exact diameter of the cake itself. 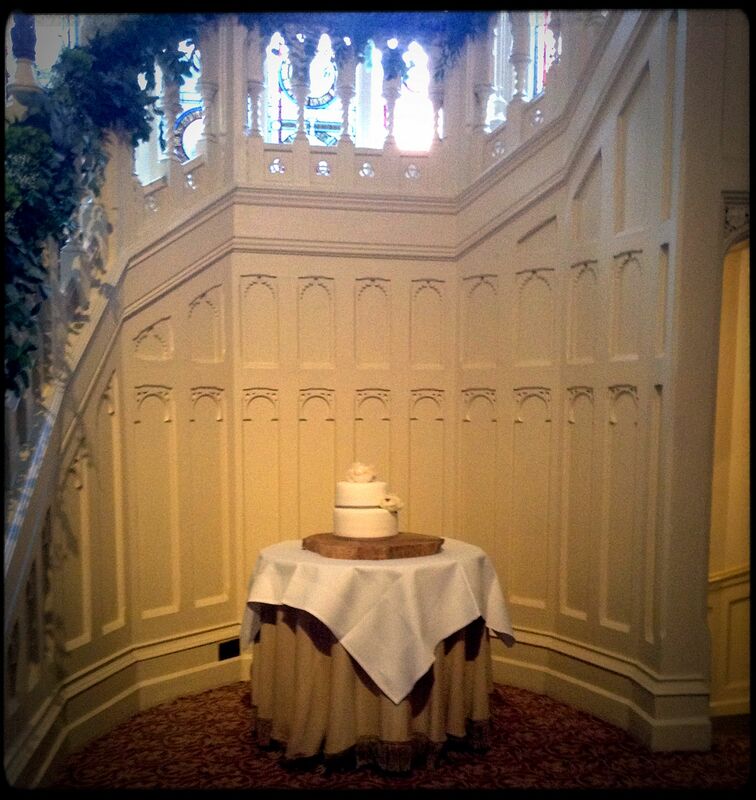 I used a cake lifter to place it carefully on the base of the cake box as soon as I had finished the fondant so that I didn’t need to move it again before I sat it on its gorgeous wooden plinth at the venue. The slightest misplaced fingerprint could’ve been a significant problem. 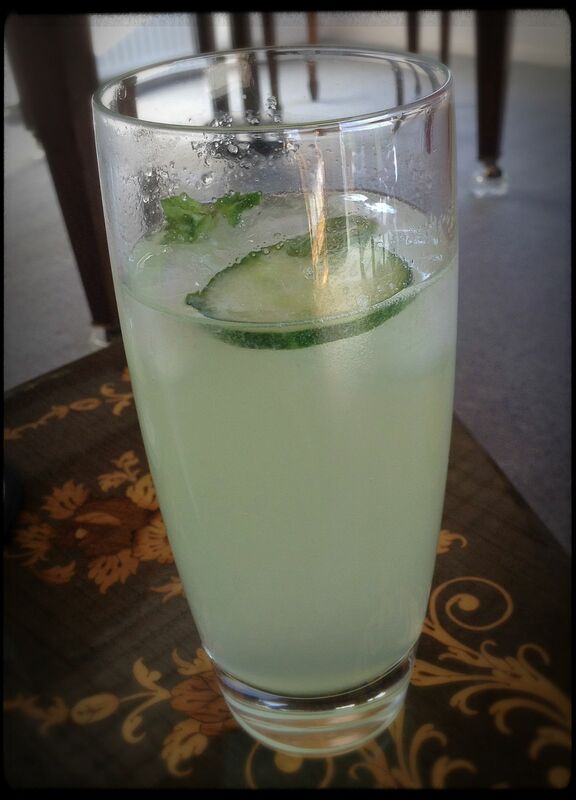 At this point, I sat down for a hard-earned gin cocktail. The following morning, I woke bright and early, mainly to check that the cakes were still there and hadn’t inexplicably imploded overnight. A short drive later, I was nervously assembling the cake at the venue with the help of some plastic dowels to make sure the top tier didn’t sink into the bottom. Finished with a ribbon chosen by the bride herself and some stunning peonies that matched her bouquet, the cake sat in its spotlight. Absolutely GORGEOUS, WOW!!!!! 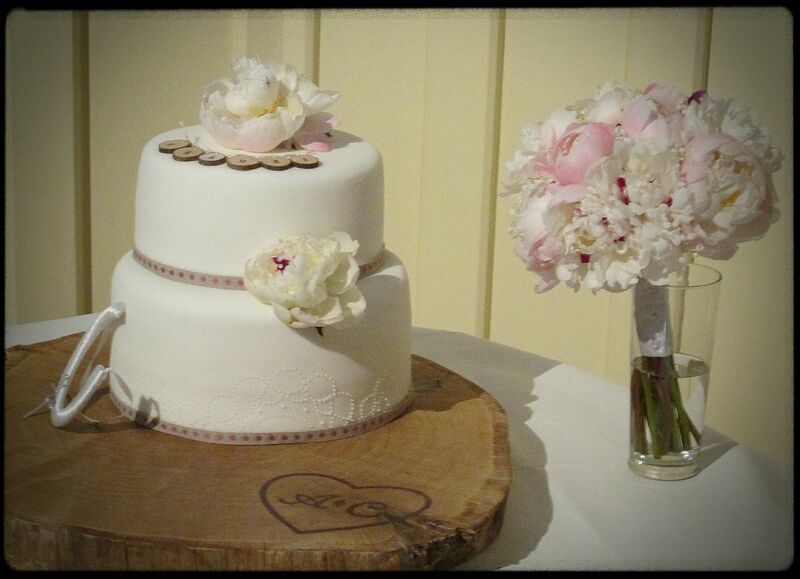 I love the peony design (the bride’s bouquet is beautiful, if I did my wedding all over again, I’d have peonies :)), the shades of pink are perfect & your icing is so incredibly smooth. Thank you, Simone! I’m so relieved it’s done. It has been on my mind for months, and I’m delighted that it turned out just as I had hoped. Hurray!